Yes, one of the challenges at The Flying Unicorn requires that we use those words somewhere in our journaling. 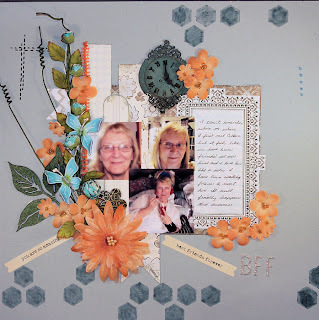 Also, Scrapbook and Cards Today has a challenge going to use one of Pagemaps sketch. Scrapbook and Cards Today is a free online scrappy magazine and you can download the current issue here. I had a fun time creating this layout about my best online friend. I can't remember when or where I met Colleen but it seems like I have known her forever. I love her like a sister and think of her all the time. When something exciting happens I want to phone her right away to let her know and when I am feeling down I want to just talk to her. When something is wrong with her, I feel it myself. I am so excited because this coming summer we are planning to spend a week camping over near her and so we will finally get to meet face to face, something "I have been waiting for ever" to do. I feel so honored and honestly I can't remember where we met either was it on Scrap Dango? Awesome LO by the way, sister.